I spent the past two weeks exploring the Baltic one fantastic city after another – Copenhagen, St. Petersburg, Helsinki and more. To get there and back, I had booked two one-way award tickets. The outbound was 62,500 American miles and $352 for British Airways First class from Miami to London. While fees are a little steep, I still thought it was a great deal since there weren’t many other flights available and it was the weekend before the Olympics started and their first class is always a very solid experience. On the return, I was coming home from Stockholm, and the best I could do at the saver level was a United from Stockholm to Newark and then Newark to Miami in business class for 50,000 miles and $70 in taxes and fees, which I transferred from Chase Ultimate Rewards. However, on my day of departure, I checked last-minute award availability and Lufthansa had opened up first class award seats on its non-stop from Frankfurt to Miami, so before I left for the airport, I reticketed myself – at no charge since I’m now a United Premier Platinum thanks to status matching (more on that in a future post)– and I was able to book my new ticket for just 17,500 miles more (67,500 total) and roughly the same $70 in taxes and fees. United now charges $75 for flight changes within 21 days of departure and they are free if you change 21+ days out. The Lufthansa First Class lounge in Frankfurt (not the First Class Terminal). 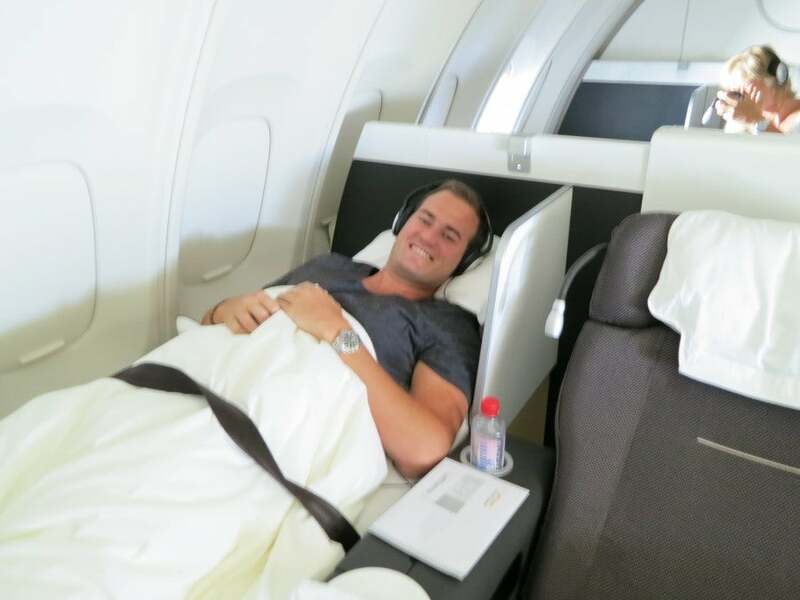 My new route had me flying business on Lufthansa from Stockholm to Frankfurt, and then transferring to the 11-hour flight from Frankfurt to Miami in first class. This itinerary was so much more preferable than connecting back in New York since summer connections there can be such a debacle thanks to horrible weather, and it’s so much nicer just to arrive in your final destination after a transatlantic flight rather than catching another flight. 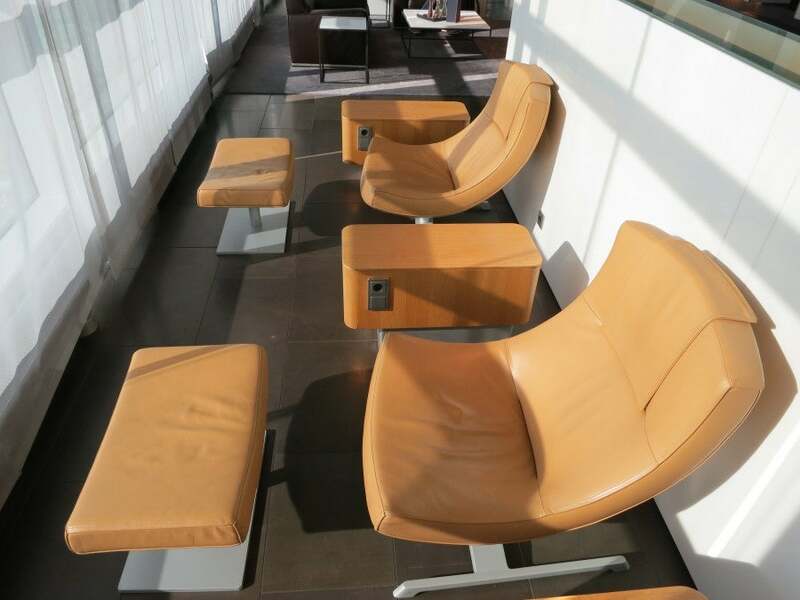 My layover in Frankfurt was just 90 minutes, so I was disappointed not to be able to check out Lufthansa’s much-touted first class terminal, which is entirely separate from the rest of the airport. First class passengers are whisked there for check in and immigrations, and then driven to their flights and dropped off on the tarmac. I guess I’ll just have to plan another first class experience to finally check it out. 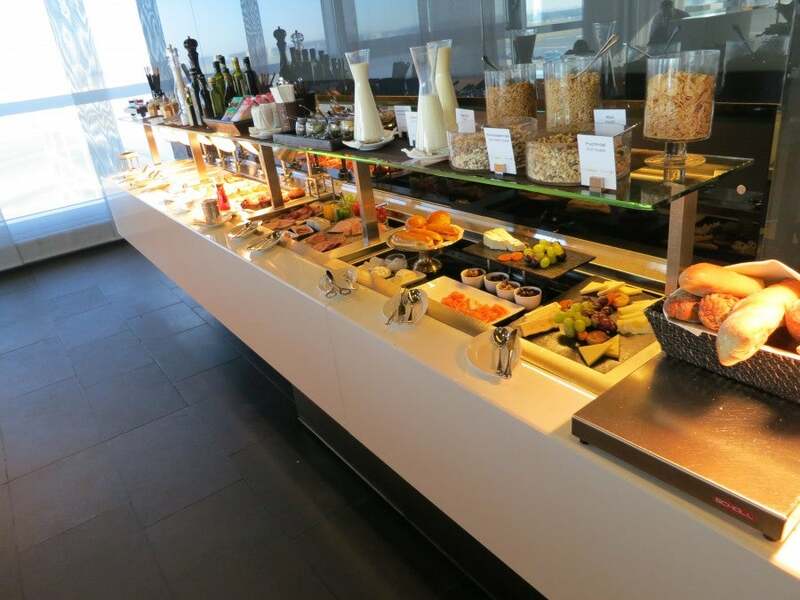 The breakfast spread at the Lufthansa First Class lounge. 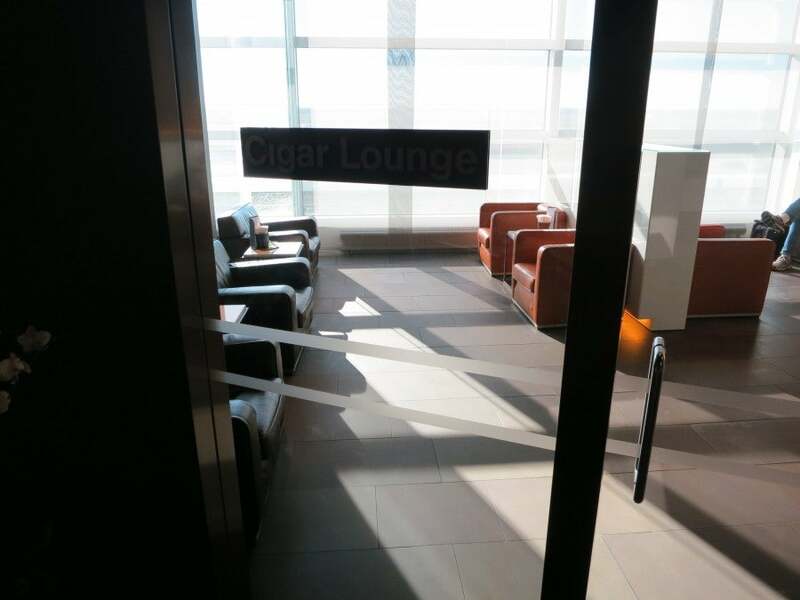 I just had to stick to the first class lounge in the terminal itself on the floor above the Senator business class lounge, though it was really nice and very quiet – much better than most business class lounges, which can get very crowded and noisy. This one had very nice lounge chairs, a relaxation room and even a cigar parlor. The first class lounge even had a cigar parlor. Boarding is one of the areas where I think Lufthansa is terrible, and I find a lot of European carriers don’t manage the process well at all. It ends up being a disorganized cattle call with a crush of people charging the gate. There is a line for first and business passengers, but it wasn’t monitored at all, so anyone could board through it. Once I got through the crowd and made my way up the steps to the 747’s upper deck, though, I felt all my cares melting away. 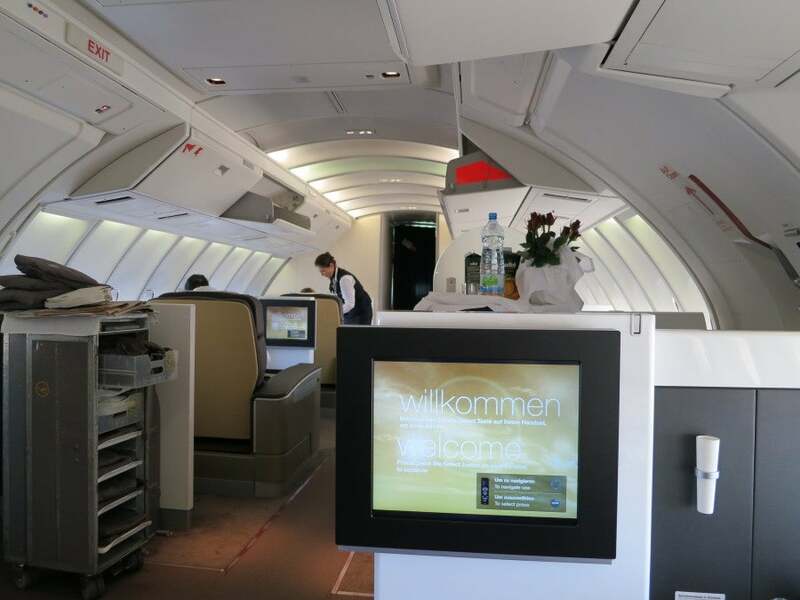 A new first class seat aboard Lufthansa’s 747-400. 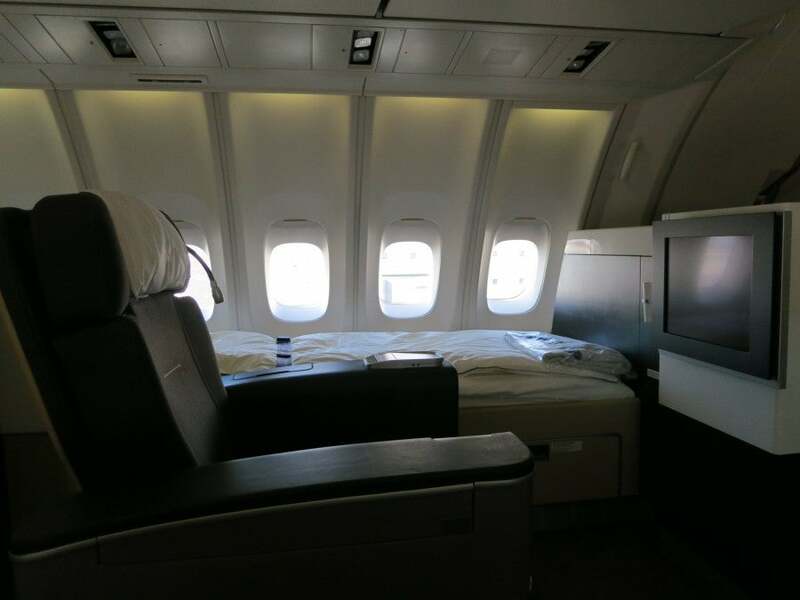 There’s nothing quite like boarding a 747 and getting to go upstairs to the upper deck – it’s a bit of real life travel fantasy which I’ve done many times now and the allure never seems to wear off. I flew Lufthansa’s old first class before, which was nice but not amazing, and I find Lufthansa’s old business class to be mediocre, so I had really been hoping to try out the new first class and that it would be as good as it looked in photos – and to my delight, when I walked up those steps, my wishes were granted. It turns out I was on one of the 11 out of 26 Lufthansa 747-400’s with this unique first class product – it’s different from the old first class aboard some of its other 747’s, from the new first class on the A380, as well as the first class product on the 747-8, so it was really a unique experience. Have a look at this video I made of the first class cabin, and then read on below for the full description. The entire upper deck is the first class cabin. There are just 8 enormous seat/bed combinations, four lining each wall. At first glance, you’d think each one was meant for two people because each has two components: a reclining seat and a huge bed which stays down the whole time so you don’t have to worry about an inoperable seat – that’s a first class flyer’s biggest nightmare; shelling out thousands of dollars (or miles) for a flight and finding out your seat doesn’t work on a very long flight. In this case, though, you always know you’ll have a lie-flat bed, and for someone who’s 6’7” like me, that’s even better news. Each of them was a staggering 90 inches in pitch, 21 inches wide, and the bed portion was 79.1 inches long, so more than enough room to stretch out even for me. It’s gluttony in the skies and I don’t even want to think about my carbon footprint on this flight. The seat was cloth and extremely comfortable, and what I liked best about it besides the huge entertainments screens and various plugs was a big pullout locker-drawer on the ground where I could store my belongings during take-off and landing including my computer, amenity kit, books, etc. The in-flight entertainment system screen was really large, but movie and TV choices were limited. The seat did have a plug for US adapters, but it wouldn’t work with my US plugs, so I used my European adapter instead, and it took me 10 minutes to figure out that I even had to flip it upside down in order to get it to work. Once it did, though, it was great, and I was able to charge my devices – sometimes on planes the current is barely strong enough to use your device without draining the battery and you just kind of break even. The in-flight entertainment screen was huge, but what was disappointing was that there were very limited. For instance, there were just 7 choices of dramas, two were foreign, and one was The Cider House Rules.. seriously. If you’re on a 14-hour flight, old-school Tobey Maguire isn’t going to cut it. Luckily, I always have my iPad or laptop with me so I watched movies on the iPad. If you have a flight coming up on Lufthansa, I’d suggest loading up on iTunes rentals beforehand. You’ve been warned. Its other major shortcoming was that the screen itself didn’t swivel, so if you wanted to lie down in the bed and watch the movie there, you’d have to lean over into the seat area or contort yourself at a weird angle. It seems like a design oversight. As I mentioned, I could stretch out to my full height with room to spare, so I slept really comfortably, though at a certain point I had to throw off the heavy duvet because the cabin got quite warm and it was just too hot under the blanket. Comparatively speaking the bed was better than BA’s or even Cathay’s because it was like a nice firm mattress rather than just a folded down seat with a cover over it. The other interesting thing was that, unlike on my recent flight from Dusseldorf to Chicago aboard a Lufthansa A340, this plane had no WiFi. The amenity kit had some strange La Mer products in it. 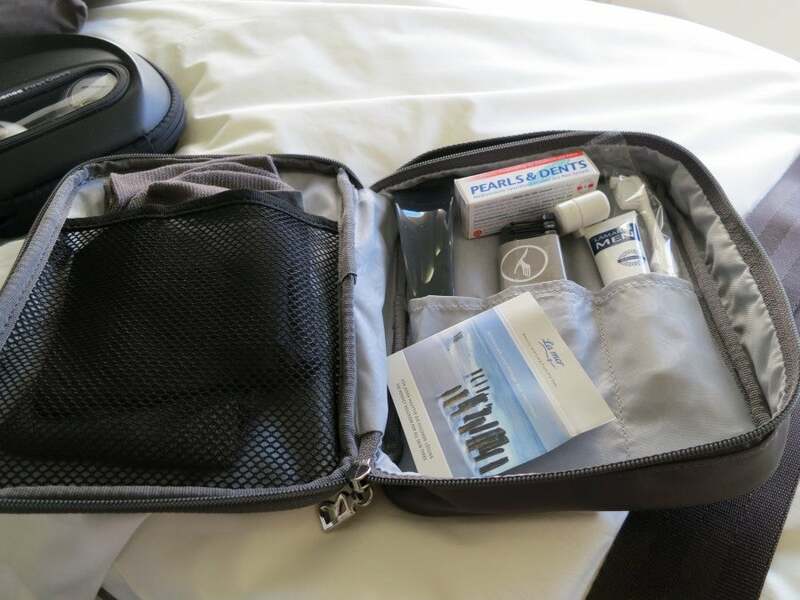 The amenity kit contained all the usual suspects – toothbrush, toothpaste, eye mask, socks, etc. – as well as loose-fitting cotton pajamas (on my other recent Lufthansa flight, the pajamas were just long-sleeve polo shirts). The skincare products were called La Mer, but they weren’t the well known, expensive brand. Instead they seemed to be a small private line that I’d never seen before. Nothing to write home about. I’ll keep this simple. The service was good – it was very regimented and sensible. The flight attendants weren’t over the top or doting like on Asian carriers I’ve flown. Nor were they extremely friendly like on my recent British Airways flight where all the crew members were chatting passengers up, smiling, joking and making conversation. The first class cabin of eight passengers had two dedicated flight attendants, but sometimes an hour would go by and you wouldn’t see anyone. They were certainly always there if you needed something, but unlike my other recent Lufthansa experience where they were periodically checking on our needs, the two on this flight seemed a bit absent. I also had a communication problem with the attendant serving my side of the plane since her English wasn’t great, but at least she was perfectly nice. All in all, decent service, but hardly memorable. I love the caviar service aboard Lufthansa. I have three words: Caviar, caviar, caviar. 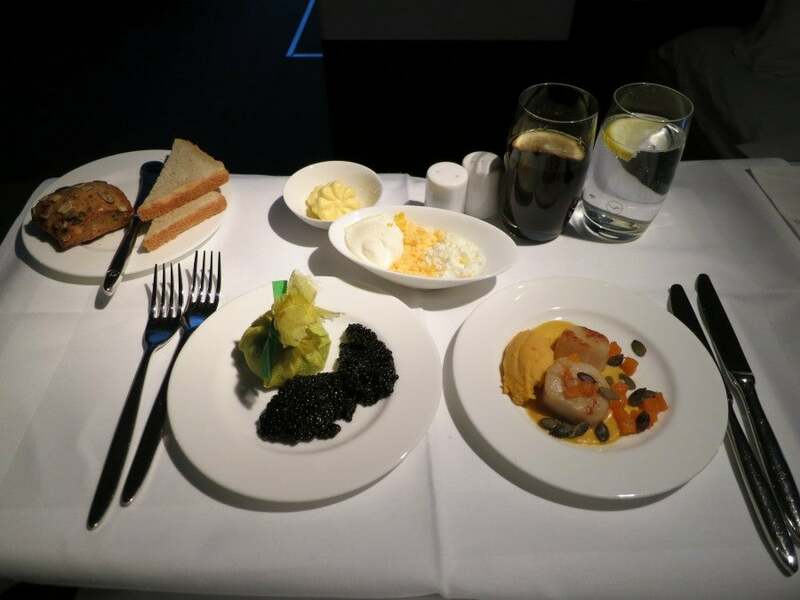 One of the things I love best about Lufthansa first class is their caviar service, which you don’t get consistently on many other carriers. The flight attendant wheels up an entire cart dedicated to the caviar service and spoons you huge dollops of the deliciously briny balls along with any of the other fixings you desire and toast points. It all goes great with the onboard champagne, Laurent Perrier. The August special, veal meatballs, were just okay. 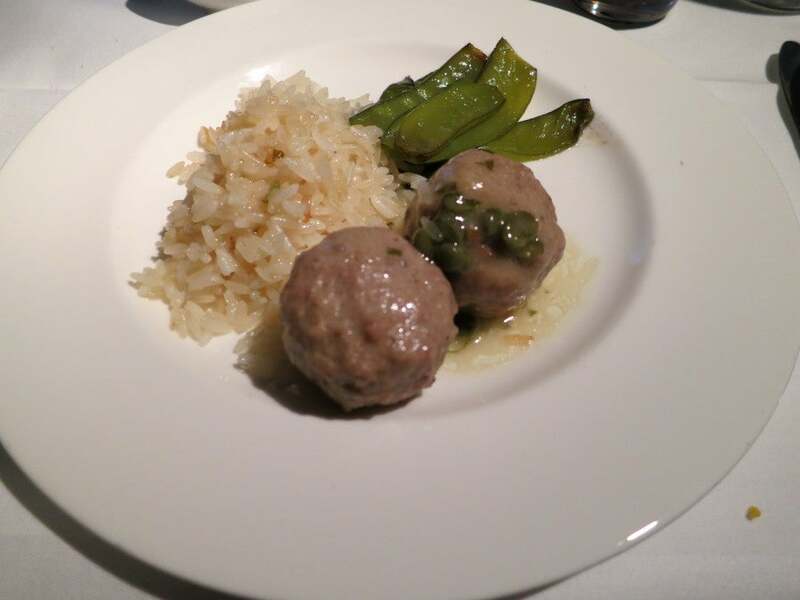 During the lunch service, I had the August special, veal meatballs, for my entrée and found them to be just okay. On my other recently Lufthansa first I had the curried reindeer, which I found to be delicious (poor Rudolph). However, what was memorable cuisine-wise came during the meal two hours before landing. It was called the “Ocean Delights” menu and was a huge selection of delicious small dishes that came on a tray and that you could choose as many of as you wanted. 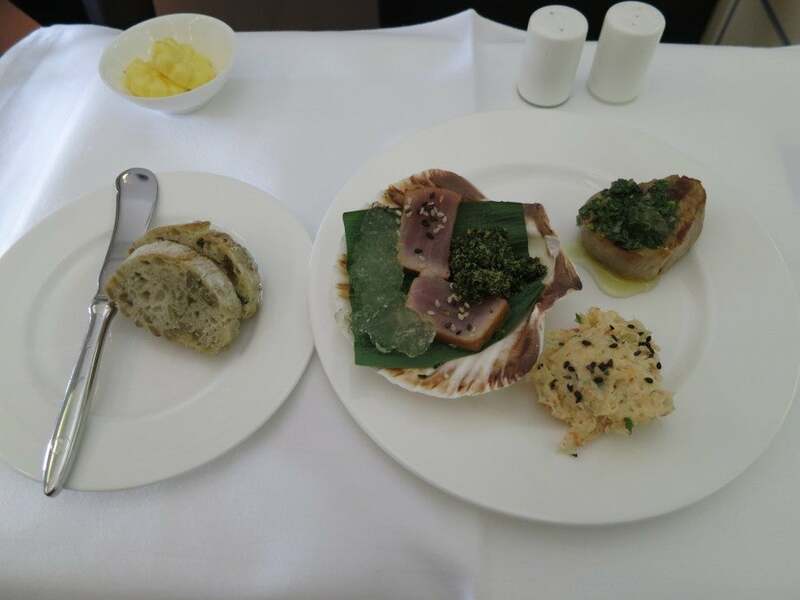 It included delicacies like tuna medallions on seaweed salad with yuzu jelly, crabmeat salad with toasted sesame seeds with mango-chili salsa (creamy, flavorful and just perfect), and Caribbean chicken breast with coriander and cashews. The seafood on the Ocean Delights menu was fantastic. For dessert I was given two mini-cones. 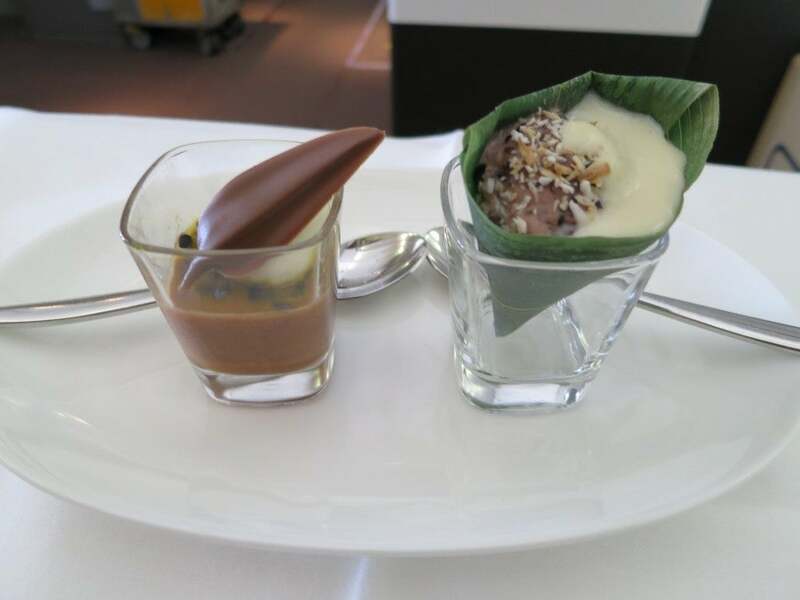 One with chocolate-chili panna cotta, and another with passion fruit, black venus rice, coconut and fresh pineapple chunks in a bamboo leaf. That just knocked it out of the park – the meal was one of my top in-flight meals of all time. The two desserts were just the final cherry on top (so to speak) of the great meal service. One of the other things I appreciated is that the entertainment system lasted until after we landed, so the flight attendants didn’t collect the Bose QC15 headsets that I love until after the flight, unlike American Airlines, whose flight attendants come down the aisles screaming that they’re collecting them an hour before landing and even shut down the entire in-flight entertainment system. Though I was on the upper deck, the flight attendants held the other passengers back for me and the others up there so we could deplane first, and with my Global Entry, I was through Immigration in 60 seconds flat. I half-expected my luggage to be waiting for me already since it had been by the time I got to the carousel in Chicago on my other flight, but it took another 15 minutes. Nothing to complain about there, though. All in all, I give this experience an enthusiastic two thumbs up. 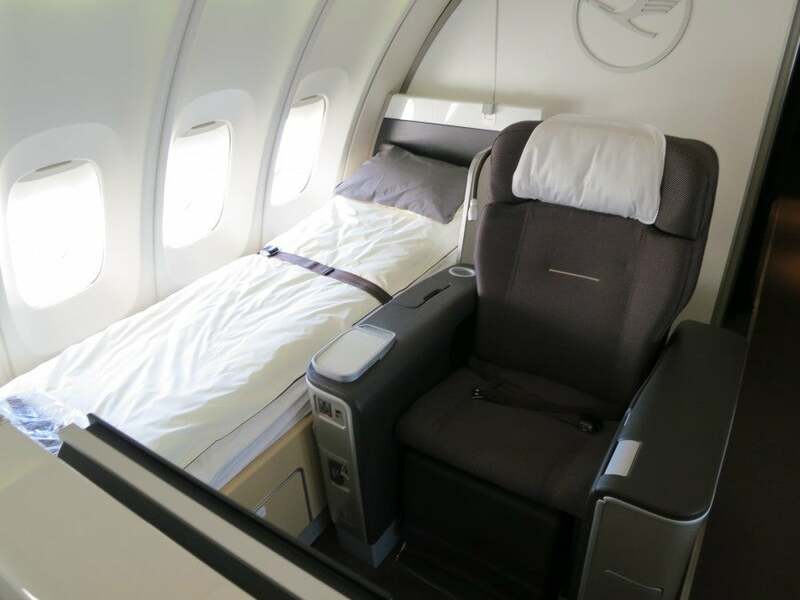 Even if you have to pay change fees to fly the new Lufthansa first, do it! The only downside is that having experiences like this ups the ante for future expectations. I might just expect two seats every time I fly international first from now on.